What if you can't afford nine-dollar tomatoes? That was the question award-winning journalist Tracie McMillan couldn't escape as she watched the debate about America's meals unfold, one that urges us to pay food's true costwhich is to say, pay more. 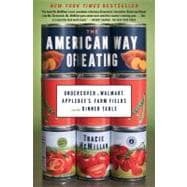 So in 2009 McMillan embarked on a groundbreaking undercover journey to see what it takes to eat well in America. For nearly a year, she worked, ate, and lived alongside the working poor to examine how Americans eat when price matters. From the fields of California, a Walmart produce aisle outside of Detroit, and the kitchen of a New York City Applebee's, McMillan takes us into the heart of America's meals. With startling intimacy she portrays the lives and food of Mexican garlic crews, Midwestern produce managers, and Caribbean line cooks, while also chronicling her own attempts to live and eat on meager wages. Along the way, she asked the questions still facing America a decade after the declaration of an obesity epidemic: Why do we eat the way we do? And how can we change it? To find out, McMillan goes beyond the food on her plate to examine the national prio-rities that put it there. With her absorbing blend of riveting narrative and formidable investigative reporting, McMillan takes us from dusty fields to clanging restaurant kitchens, linking her work to the quality of our mealsand always placing her observations in the context of America's approach not just to farms and kitchens but to wages and work. The surprising answers that McMillan found on her journey have profound implications for our food and agriculture, and also for how we see ourselves as a nation. Through stunning reportage, Tracie McMillan makes the simple case thatcity or country, rich or pooreveryone wants good food. Fearlessly reported and beautifully written, The American Way of Eating goes beyond statistics and culture wars to deliver a book that is fiercely intelligent and compulsively readable. Talking about dinner will never be the same again. The first Brooklyn supermarket I ever walked into had a cockroach in the deli. Not one of those stealthy critters stealing along the crevices in the floor, or hanging out backstage in dry storage. No, this was a proud-to-be-here New York City roach, crawling openly up the wall’s white tile before dropping, unceremoniously, onto the meat slicer below. I decided to skip the lunchmeat and headed for the produce aisle. I sought out hard, pink tomatoes and pale spheres of iceberg lettuce, bags of Red Delicious apples and dusty sacks of potatoes. The contents of my grocery basket telegraphed my Midwestern upbringing. I’d been so busy putting myself through college by running errands for a fashion designer, tutoring rich kids, tutoring public high school kids, waiting tables at a barbecue joint, and a slew of other odd jobs that I hadn’t yet made the city my home. I paid for the food and, to save $1.50 on bus fare, walked ten blocks, about half a mile, home. As I piled the groceries on the counter, I told my roommate about the roach. That’s pretty gross, he said. Maybe we can shop somewhere else? But we never did. We were students, keeping rent low by living an hour from campus in a neighborhood thick with families headed by dishwashers and seamstresses, housekeepers and day laborers. Neighborhood signs were dotted with script in Polish, Chinese, and Spanish. If there were good ethnic shops I was too blind to see them; raised in rural Michigan, the only food stores I knew to look for were supermarkets. And the roach-in-the-deli was the only one we could walk to. We didn’t cook much, anyway. We were too busy. All of this—the chore of finding food, the lack of time to do anything with it when we did, the indifference to our meals—was familiar. I grew up in a small town outside Flint. My dad sold lawn equipment for a living. My mom was gravely ill for nearly a decade. Most of my family’s time and money went to medical bills, and I grew up eating the kind of meals you’d expect from an effectively single working dad. Sometimes I helped make them, especially if it meant we’d end up with my favorites, like Tuna Helper, on the table. On nights when I couldn’t sleep, I’d page through my mom’s Good Housekeeping cookbook and bake cakes and breads to entertain myself while, ostensibly, helping out around the house. We ate a lot of Helper meals and Ortega Taco Dinners when I was growing up, and I liked them. We had salads of chopped iceberg lettuce tossed with diced carrots, celery, wedges of tomato, and some Wish-Bone Ranch dressing. On weeknights, mashed potatoes came from a box, toast was brushed with melted Country Crock and sprinkled with garlic salt, and Miracle Whip held together the pasta salad. Sure, home-cooked and farm-fresh stuff was great. And sometimes we did eat like that. In the summers, my dad’s garden, a grove of vegetable plants spiking up through black plastic sheeting and an inch of weed killer, would let us feast on tomatoes and peppers cheaply. And most Sundays, when my dad had relaxed from his week, he’d throw a roast in the oven, boil some potatoes, and steam some vegetables. But regularly eating food that took that much time or money—or, most outrageously of all, both—wasn’t for people like us. It was for the people my grandmother described, with equal parts envy and derision, as fancy; my father’s word was snob. And I wasn’t about to be like that. No, here in Brooklyn I’d do the same thing my family had done in Michigan. I’d make do with my culinary lot in life. If I didn’t have extra money to buy healthy food, or the time to prepare it, that meant the cheap and the processed. For a very long time, I couldn’t see it any other way. Like all myths, the idea that only the affluent and educated care about their meals has spread not because it is true, but because parts of it are. Healthier food is more expensive; that much is true. So is the fact that it can be hard to find in poor neighborhoods. And yet it requires an impossible leap of logic to conclude from these facts that only the rich care about their meals. “Food culture in the United States has long been cast as the property of a privileged class. It is nothing of the kind,” wrote Barbara Kingsolver in Animal, Vegetable, Miracle. She may be right, but for most people—myself included—seeing good food as a luxury lifestyle product has been so deeply embedded in our thinking about our meals that we barely notice it. I didn’t until I met Vanessa. I had been living in New York for nearly a decade, and was covering the poverty beat for a small magazine. I met people in welfare offices, child care centers, housing project courtyards, and after-school programs, and wrote stories about them; in doing so, I often ended up in their homes. I ate Jimmy Dean hamburgers in the kitchen of a fortysomething lady gang leader. I watched a Dominican home health aide run her four kids through math homework while spiraling the peel off an orange with a paring knife. I shared crackers and spreadable cheese during snack time at a child care center in a brownstone apartment. But I was there to write about welfare rules and crappy jobs, not food, so I hardly noticed it. What did food have to do with my work, anyway? The people I was writing about weren’t fancy. Neither was I. For years, I insisted food wasn’t important to me. And yet, I had always made birthday cakes from scratch for my friends. In college, I shoplifted spices from an A&P to experiment with Indian curries. And while I kept my own grocery budget modest, my college years saw me working for an affluent family and occasionally cooking their dinner—leading me to stumble through a world of cookbooks and ingredients beyond Betty Crocker. In spite of myself, I started cooking fancy food: Moroccan stews, chicken breast and portobello mushrooms with balsamic vinegar, lentils green and red and yellow. That’s fancy food, for fancy people. Just who do you think you are? said my Midwestern upbringing. But did you taste that tomato, that cheese, those spices? replied the burgeoning New Yorker. It’s so worth it. The Midwesterner always won, though, throwing down this gauntlet: Even if it’s worth it, I can’t afford to eat like that. I’d grown resigned to this annoyingly intractable debate over my meals. Fancy food was for the rich; box meals were for the rest of us, and there was no point in making a fuss about it. This idea was so ingrained in me that I never even bothered to see how much it would cost to cook better meals from scratch. Vanessa was pure New York. She was short, still sporting a trace of baby fat, her tawny curls pulled into the same slicked-back ponytail as so many of the other girls filtering through the city’s high schools. Mouthy and freckled. Brown eyes glinting with mischief. Vanessa was also ambitious enough that she’d gotten into a paid after-school internship program in Manhattan. The only requirement to get the stipend was that she attend one of several classes offered by a youth services agency. She had chosen a cooking class built around themes of health and environmentally friendly farming, and that’s where I met her. I didn’t want to write about the class. I wanted to be writing about important things like the city’s plan to close down child care centers. Or domestic violence programs that weren’t getting enough funding. I didn’t see the point in following a cooking class, much less one run by a young man who kept going on about yoga and greens and who—save for the fact that he was black—struck me as a well-intentioned hippie. I sat in the class, took notes, and paid extra attention whenever a kid declared a love of junk food or scowled at the mention of a vegetable. Ronny, a rangy fourteen-year-old from Washington Heights, proclaimed his loyalty to McDonald’s, too. “I’m not going to change the way I eat. I’ve got to live my life,” he said, adding that he went there almost every day. I observed the class off and on for six months, and toward the end of it Vanessa agreed to let me come over to her house. She lived with her grandparents in a rickety two-family next to a vacant lot. Vanessa’s grandmother cooked for a nearby Head Start program, and at home she refused to cave in to her granddaughter’s taste for junk food. Instead, she fed Vanessa traditional Latin-Caribbean fare: pots of rice and beans, platters of plÁtanos, sticky and sweet. “It’s kind of hard to eat healthy around here,” said Vanessa, and we went for a walk to Burger King, where she got a Whopper and washed it down with seven half-and-half creamers, grabbed for free out of the bin and squirted, one by one, directly into her mouth. This was not promising insofar as health went. But the more we talked, the clearer it became that Vanessa understood quite well that she should eat better. We were at Burger King for the same reasons her friends ate there almost daily: “They know it’s not healthy, but it’s what’s there and what’s easy to make.” Vanessa told me that, inspired by the health component of her cooking class, she had stopped eating fast food every day and tried not to have it more than three times a week. Vanessa hadn’t said anything groundbreaking, she’d just made a series of observations that added up to the same truth we’d both grown up with: Eating poorly is easier than eating well. That’s why she was eating badly. Vanessa didn’t eat junk because she didn’t know better, or because her family didn’t cook, or because she didn’t care about food and health. It was just easier to find junk in her neighborhood, her city, her life. And for the first time in my life, I began to ask why. Once I posed that question, I found answers everywhere. There were obvious ones, like the fact that good, fresh food tends to cost more, especially in cities, making it difficult, if not impossible, for folks of limited means to afford it. Or the fact that New York’s ubiquitous corner stores specialized in ice cream pints, Iced Honey Buns, and cola, not produce. These facts had been in the background of my entire life, but when I finally stopped to look at them, I saw this foodscape for what it was: an abandonment of America’s great promise, implicit in every tale of rising fortunes and opportunity from Thomas Jefferson to Barack Obama, that it would always feed its citizens well. If I lived in a land of plenty, how could the activists be right when they told me supermarkets, even scrappy ones, simply didn’t open up shop in the city’s poorer sections? That hadn’t been my experience. I’d long since moved from my first Brooklyn neighborhood to a second, making my home at the edge of Bedford-Stuyvesant. This is the ghetto that birthed a lineage of black American culture from Richard Wright to Biggie Smalls, and a framed portrait of Biggie hung in our supermarket; neighborhood lore held that he had bagged groceries there as a kid. Leaning on a knob-topped cane and wearing a sleek black suit, this icon of New York rap looked out over shelves crammed with vegetarian options for rastas, halal ones for the Muslims, bottles of bitters for West Indian stews, and a wide swath of the Goya product line for Latinos. The produce didn’t look great, but it was passable; I could still eat. This, I asked myself, was a lack of options? I lifted my head up, looked past my neighborhood, and asked harder questions: Where were the city’s supermarkets? How big were they? How many people did they feed? In the end, I compiled the first zip-code-by-zip-code guide to food access in the city, and it was true: Supermarkets were few and far between, and the city’s poor had the fewest. In the arty-turned-affluent neighborhood of SoHo, each resident had more than seventeen square feet of supermarket space to shop in. Ten miles north in Washington Heights, where Ronny lived, family incomes were one-third of their counterparts’ in SoHo—and they made do with one-half of one square foot of supermarket space per person, just 3 percent of what the SoHo-ites had. I had discovered what is now called a food desert: a community with insufficient grocery stores for its population. The more I looked out on this vast landscape, the less I recognized any of it. And yet I couldn’t stop looking, trying to figure out what had changed. Something had gotten under my skin and changed how I saw the world. And the first thing that I could recognize as truth in this strange new place was what I learned at Vanessa’s side: Everyone wants good food. I’m not the only one who’s found a new world through food. In the last decade, a burgeoning fascination with our meals has swept popular culture, finding its way into nearly every facet of public life. This is a new era in American food culture, pairing the rise of the cult of the chef with a celebration of the home cook, the stylized instruction of the Food Network with DIY dinner parties. There are countless books and blogs and websites that chronicle food obsessions. Whole identities have emerged around the contents of one’s plate: locavores, flexitarians, Slow Foodies, freegans, and Chowhounds. Public figures of all stripes are drawing attention to eating well and living healthy. First Lady Michelle Obama has made childhood obesity her cause, encouraging us all to plant gardens, cook more, eat whole grains and fresh vegetables, get outdoors, and get some exercise. The cooking celebrity Rachael Ray has dedicated her nonprofit work to teaching kids and parents to cook and getting them to make better health decisions. Even Ted Nugent, an ardent pro-gun rocker best known for his 1970s anthem “Cat Scratch Fever,” urges his fans to grow and hunt their own food, get plenty of exercise, avoid alcohol, and make “optimum health job number one.”† Meanwhile, a growing pantheon of food philosophers from Alice Waters to Michael Pollan is coaching us from the sidelines, reshaping the way America thinks about its food and establishing new ideals for what people should be eating and how it should be grown. All of this begets an obvious question: How do we put those ideals within everyone’s reach? How do we transform them from luxury products into typical ones? How do we make a foodscape crowded with junk into an anomaly, and one flush with fresh, healthy food the norm? There’s another advantage other developed countries have when it comes to food cultures: money and time. Americans get derided for spending too little of both on their meals, usually with the observation that Americans spend about 13 percent of their take-home income on food, while the French spend about 20 percent. By spending more of their money on food, goes the thinking, the French have made food a priority—and they are also less fat. But it is also true that their government provides quality health and child care, higher education, and transportation at little or no out-of-pocket cost to its citizens*—not to mention mandating five weeks of paid vacation each year. The average American family may spend about 7 percent less of their paycheck on their meals than the French, but they also spend 7 percent more of it on education and health care. It’s not just a gastronomic culture that leads the French to prioritize their meals, but a political and social landscape that makes it much easier for them to do so. Today, America talks about its food as a choice made from equal footing—a vote, if you will, with our fork. Under this logic, it’s as easy for me to choose to eat healthy food as for Vanessa, or for a rural migrant farmworker, or for a lawyer on the Upper East Side. If the decade that has passed since the declaration of an obesity epidemic is any indication, the primary strategy in use—repeatedly telling people, regardless of their income, to change their habits—has failed. Instead, we need to examine how to make it easier to eat well. Easy comes up again and again—and it’s linked with good health choices as well as poor ones. For example, rates of obesity typically rise the farther people live from grocery stores—and for every additional supermarket in a census tract, fruit and vegetable consumption goes up by as much as 32 percent. Higher obesity rates correlate with spending less time preparing and eating our food. And when we make it cheaper (one form of easier) to buy produce, people do it. In 2010, farmers’ markets across the country began adopting a program to match food-stamp clients’ spending on local fruits and vegetables by up to $20 a week. In just the first year, food stamp spending at the markets increased by as much as five and six times—more than the matching funds would account for, indicating that people then supplemented the coupons with their own money, too. And 87 percent of clients say the coupons have enabled them to eat produce they would have otherwise done without. So maybe we’ve been asking the wrong question. Instead of asking how to change our priorities, maybe we should be asking the question behind all of Vanessa’s ruminations: Why is it so difficult to eat well? A decade ago, asking this would have seemed tantamount to asking why the sky is blue. Today, it is simply the next logical step in the growing conversation about food and health. To be fair, food is only one of our nation’s paradoxes—our founding fathers proclaimed a free republic even as some of them owned slaves; we extended the right to vote to men but neglected to include the women—but it is perhaps the most stubborn. More than two centuries after Jefferson wrote of the inexcusable divide between the meals of the poor and the rich, we’ve yet to solve what food historian Harvey Levenstein has aptly dubbed the “paradox of plenty.” Put simply, our agriculture is abundant but healthy diets are not. The American way of eating is defined not by plenty, but by the simultaneous, contradictory, relentless presence of scarce nutrition in its midst. And though this conundrum may be seen most clearly in America’s extravagant harvests alongside our declining health, it is slowly taking root across the globe. This intransigent paradox has spread by many means, first and foremost by our industrial agriculture. Focused on grain that can be morphed into an endless array of food products, and using chemicals developed by U.S. companies, the American way of growing food has found its way to the humblest of African villages and the most sophisticated of South American farms, deposited there by our aid programs, our philanthropists, and international institutions. The paradox continued to grow as other nations followed the trail of our supermarket system, once considered an American idiosyncrasy and now so common abroad that Walmart isn’t only the largest grocer in the United States, but in the world. And it has spread even further via processed foods—pioneered in American factories, kitchens, and board rooms—that rely on the cheap grain produced by our agriculture and are tailor-made for supermarkets and restaurants that demand shelf-stable foodstuffs. There are mounting pressures that may change all of this, intensifying climate change and declining soil health not least among them, but the pattern is unmistakably set: The American way of eating is on track to become that of the world, too. In the pages that follow, you’ll find the story of my investigation into just how America came to eat this way, why we keep doing it, and what it would take to change it. I spent a year working undercover in America’s contemporary food system, from California to Michigan to New York, drawn to each place because I wanted to live and work inside three segments of our food system—farm, store, and restaurant—and learn how the whole machine works. I was looking, on one hand, to understand the internal logic that governs the movement of every apple and zucchini from the earth to a produce aisle and onto our dinner plate. Yet, to truly understand a system, you can’t just examine its structures; you have to look at its effects, too. I wanted to know how dinner gets on the table for American families, how the pressures of work and economy get translated into their meals. This was not, I had to admit, something I could learn from my cozy single-girl-in-Brooklyn apartment. And the best way—really, the only way—to do this was to leave my regular life behind for a little while and live and work among the rest of America. In each job, I lived and ate off the wages I earned, paying rent and buying groceries as if it were, in fact, my real life. I started at the lowest end of the economic spectrum, as a laborer in the fields where a healthy diet begins: harvesting fruits and vegetables (the one dietary priority that everyone seems to agree on). Fruits and vegetables receive less than 5 percent of the $18.3 billion we allocated in 2009 for federal agricultural subsidies, but they are crucial for a healthy diet; California’s innumerable valleys are the cradle of their production, so that’s where I looked for work. I harvested grapes, I sorted peaches, and I cut garlic, moving around—like a lot of farmworkers—in the hope of finding better work and better housing. Almost a year later, I visited the place where most food ends up, in a kitchen—though the job I took, as an expediter at a Brooklyn Applebee’s, helps to produce a very specific kind of meal. I chose Applebee’s because it’s the biggest casual dining restaurant in America and the world, and because these kinds of restaurants are rarely equated with the fast food their meals so closely resemble. Between the farm and the plate, I went to work in a part of the food system that’s been curiously absent from most of today’s food debates: the supermarket. I worked as a stock clerk in two Michigan Walmart stores, most notably one outside Detroit. When we talk about the problems with our food today, we tend to focus on how we grow it or what we eat. But there is another problem, just as big, that we tend to skip over: how we arrange for the food to get from the farm to the plate. And today, that role is played almost exclusively by supermarkets and supercenters, the latter being Walmart’s term for its stores that include a supermarket. Today, supermarkets supply more than two-thirds of the food we eat at home while the rest comes to us via “nontraditional food retail” like convenience stores and supercenters on the industrial end of things, and farmers’ markets and community-supported agriculture buying clubs on the artisanal end. In 2009, farmers’ markets had grown to supply just over 1 percent of America’s groceries; Walmart controlled nearly one-quarter of America’s food supply, significantly more than the next three biggest competitors combined. This makes Walmart a massive produce locomotive, the single greatest conveyance delivering farm produce and myriad other products to millions of Americans. It also highlights the fact that food is one of the only base human needs where the American government lets the private market dictate its delivery to our communities. When we build a new city, the public sector works to make sure that certain needs are met safely and affordably: roads, water, electricity, telephones. But, for reasons that are just beginning to be publicly questioned, America has traditionally done nothing to make sure there is also food in that new city. Food deserts are one result of this agnostic approach to food distribution, and as a city of 700,000 without a single national grocer, Detroit has become that problem’s reluctant (and in some ways undeserving) poster child. I lived there, commuting to a suburban Walmart—just as, I presumed, anyone living there might do for grocery shopping. The longer I stayed, the more I came to see that Detroit has as many lessons to teach us as problems to solve. More than an investigation, though, this is also a book about how food works in our lives, how priorities around health and convenience and cost shift when resources are tight—and what we won’t compromise on even when they are. Truthfully, it’s mostly about how food worked, for a period of time, in my life, but it also traces the contours of the lives and meals of the people with whom I lived and worked. When I began this project, I was aware that much of the difference between myself and America’s working poor had less to do with economics than education and geography. My life as a writer is flexible, giving me the ability to take extra time with my shopping. I belong, by virtue of geography and free time, to a cooperative grocery store, which keeps my food both affordable and of unusually high quality. I work from home, so I can cook throughout the day—and doing so is easy for me, since I started learning to cook around age seven. I am also a childless adult, free to eat whatever I want, whenever I feel like it. Even before considering income, my daily food reality is very different from what’s available to most Americans whose incomes match, or fall beneath, mine. That’s a polite way of saying I believed that the way I thought about food was so deeply removed from the “rest” of America that it would be foreign—inapplicable, even—once I descended the class ladder a few rungs. Implicit in that is the idea that the food culture I had chosen for myself was not only different from, but a little bit superior to, the others on offer throughout America’s kitchens. Like most armors, this hubris protected me from feeling as if I didn’t know what I was doing—something most of us need from time to time, and almost always when we leave home behind. But it also obscured my view and limited my movement. Eventually, I had to strip myself of it, and try to look at the world in a new way, asking the question, What would it take for us all to eat well? I didn’t know; there’s no way I could have. But, luckily, I’m a reporter. What I don’t know, I can go find out.